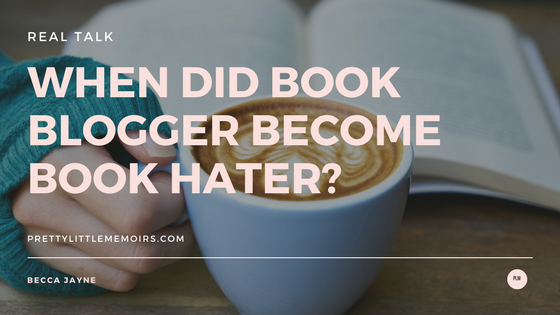 When Did Book Blogger Become Book Hater? Real talk: I think I've always wanted to be a Book Blogger. When I was younger, I'd see these fascinating blogs and how they talked about books like they were falling diamonds from the sky and my love for books could actually be like that. But over the years, something has changed. The more that I see book bloggers pop-up (and that's a huge thing, in an age where people are more glued to their phones than their heads in a book), the more that I see people bashing books. So the question that I pondered today was: When Did Book Blogger Become Book Hater? It's a valid statement. I've gone over it in my head countless times, but it's the truth. I see some bloggers - scratch that, they aren't even bloggers. They only give books 1-2 stars and bash writing. News flash: that is not book blogging. The phrase book blogger is meant to be a community that thrives on togetherness, praising of books and constructive criticism. These readers/bloggers have not grasped the line between saying something wasn't right in a book to downright vicious hatred toward the author, publisher and fans of the books. Constructive Criticism is something that you learn along the way in Book Blogging. It's the difference between rating a book from 1-5 and noting on why. Sometimes these are called pros and cons. There isn't a "right way" to book blog, and even if you didn't want to review books, and just do a little book talk, that's 100% amazing! And I love blogs, small and big! But the blogs that thrive on low ratings, the ones that seem to spin on a carousel of nit-picking an Authors hard work? That isn't a book blogger. That's a book hater. Maybe you don't know you're a book hater. How many books have you rated below 3 stars in the past, say, six months? Is it greater than the amount you've rated 3 or above? Do you only rate books below 3 stars? Maybe it's time for a step-back and a look at your blog, at your preferred reading...I don't know. I don't know what makes a book hater. All I know is that they aren't part of the hard-working and devoted bookish community that I am a part of and love with my whole heart. To me, a book blogger is someone who loves books. They read, fall in love with the characters and fangirl when they meet their favourite author, or when they meet someone who loves the same trilogy. They are friendly, easy to talk to and their blogs and full of praise, constructive words and togetherness. I'm not the only one who thinks that. I reached out to a select amount of random readers of my blog (as you may have seen) and 95% of them said they would unfollow or stop reading a blog if they were repetitively destructive. Aren't those facts a little....scary, if you're what's known as a "book hater"? All I know is that I love books. I love book bloggers. And I try my hardest to be constructive in the best way possible. Most bloggers I know are like me. They don't believe in all this new hate-to-be-popular malarkey. Do you? I personally am not a fan of the book bashers, but people seem to love these reviews. I DNF books I am not enjoying, so any book I finish gets at least 3 stars. I like to put positive energy out there in the universe too, so I keep it positive. I am ok with bloggers, who respectfully critique a book, but some are rude, and they don't even consider that someone put their blood, sweat, and tears into that book. I can't be like that.